I've been unemployed since my MA-based, high-tech employer off-shored their (my) local team last Sept. When I applied for a job today, the on-line application said cover letters were optional. That would normally save me the work of writing one, but I decided instead to add something different: an essay on a topic of personal interest, the evolution of marketing to children. Why do it? Who knows, maybe it'll stand out in the sea of sameness that all piles of resumes become. If not, at least I've outlined ideas worth diving into later. 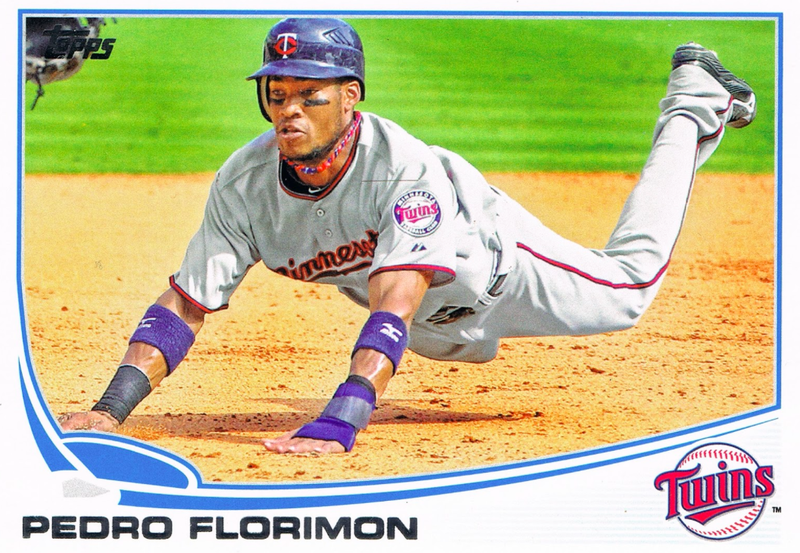 Collectors will see how this intertwines with baseball cards, since most of us started plunking down money for packs at a young age. I started at 8, but I've talked to some who were building sets at 5. If you collected cards a century ago, though, you weren't buying the cards, at least not directly. You were buying tobacco. When kids managed to squirrel away savings, they often spent them on life-shortening cigarettes in pursuit of colorful cards. If there's one thing I love about the modern era, it's that we're so far removed from cigarette marketers controlling the hobby. So here's what I wrote, interspersed with blog-only card images. While the application page says a cover letter's optional, one of my favorite interview questions is to ask the candidate to teach me something about a topic they know deeply that others don't. In that spirit, here's a brief history, for good or ill, of how companies began marketing to children. Back in the late 19th century, few credited children with the "potential" that we do today, often sending them into class-delineated factories or menial trades they could do for less pay than adults. What little money children earned went back to families, as the thinking went, so advertisers didn't consider them potential customers. They aimed at two other groups: professional men (or farmers) and women who made household purchasing decisions. The dominant luxury industry of that time was tobacco, both in popular use and in advertising. Cigarettes, rolling tobacco, chaw, cigars, snuff, pipes, and so on. We know from legal history how cynically 20th-century tobacco marketers targeted everyone, clandestinely attracting new teen smokers with a purportedly adult product. While early tobacco makers didn't "discover" children as a market intentionally, they set the wheels in motion for advertisers to target what's now a quarter of America's buying power. In the 1880s, tobacco growers turned two technologies, mechanical packaging and color lithography, into a landmark promotional campaign, the first mass-produced, in-pack trading cards. These cards enthralled both adults and kids, transporting people who rarely left their home town to distant, exciting lands. 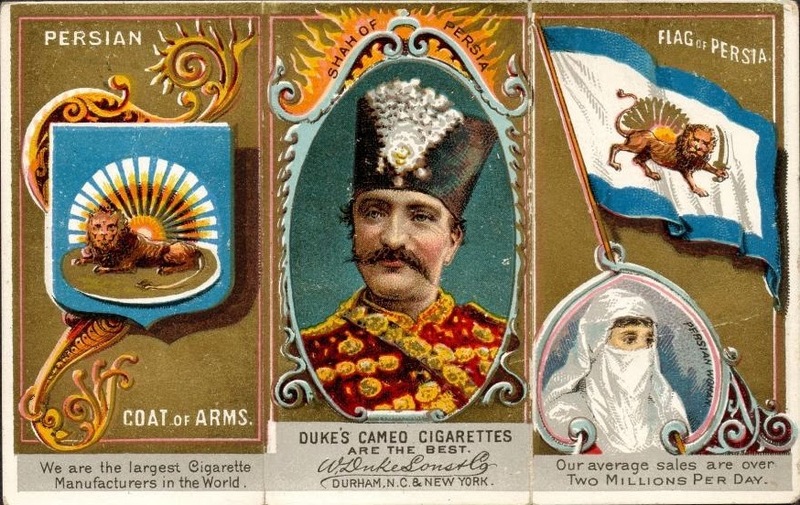 Duke's Cigarettes "Rulers, Flags, and Coat of Arms"
Promotional cards covered dozens of subjects and proved massively successful. 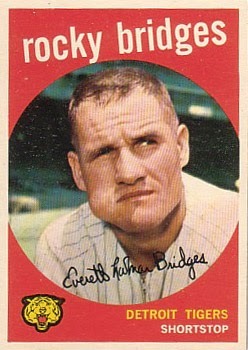 While aimed at adults, resourceful children also purchased (and learned to smoke) their own packs in search of cards. 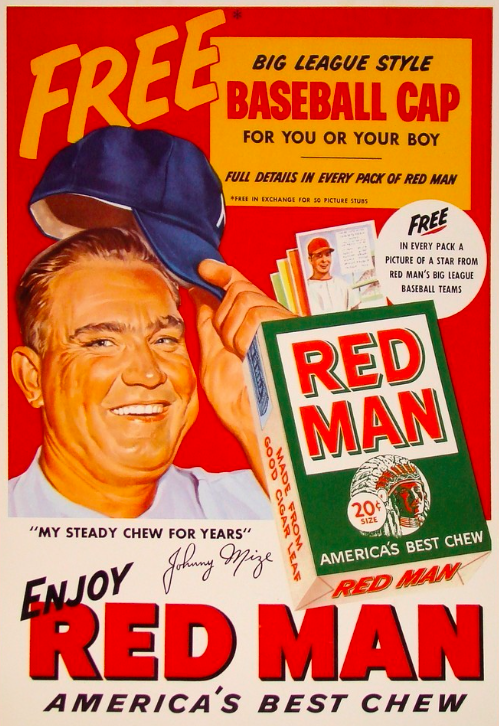 The money that flowed into tobacco coffers fed more and "better" marketing. In cities with baseball teams, cigarette makers inked the sport's early stars to promotional contracts, drawing in still more smokers of all ages. 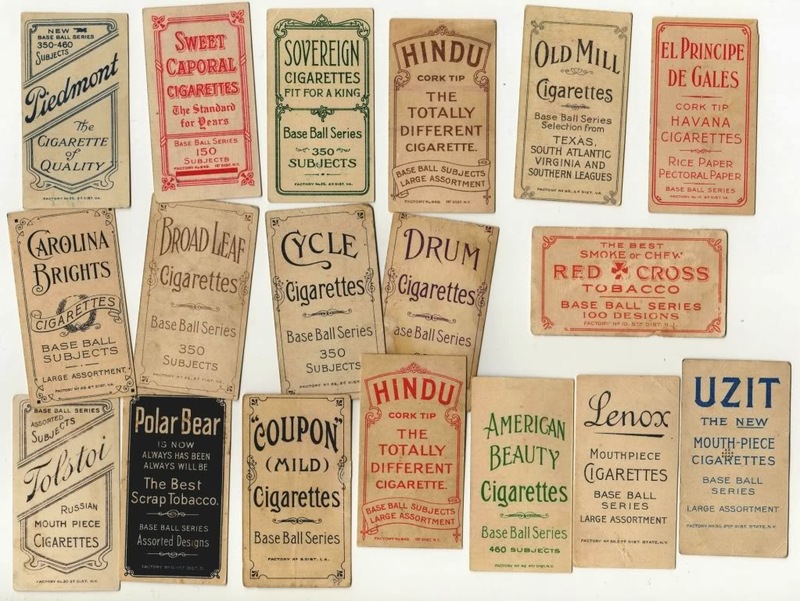 Prior to the dissolution of several tobacco trusts, their enduring business success meant advertisers from all industries looked to cigarettes as the example to follow. While spiraling costs (and their military supply business) pushed tobacco makers out of "kid-friendly" trading cards prior to WWI, by that time they'd been the dominant force in marketing for two generations. 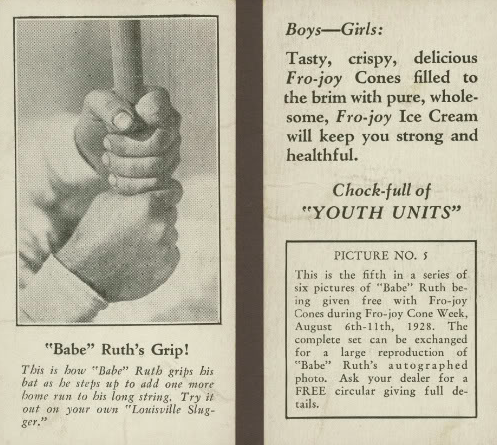 When candy and ice cream companies entered the 1920s trading card market, they appealed to kids directly, reflecting a shift in their buying power. Expanded programs of public education added a layer of uniformity to schoolchildren that allowed more and more marketers to use the same approaches seen in tobacco's success. First, find something children aspire to (like a baseball or movie career). Second, cross-promote that goal with a cheap, mass-market product like caramel or chewing gum. Third, make your product familiar in the media through sponsorship. 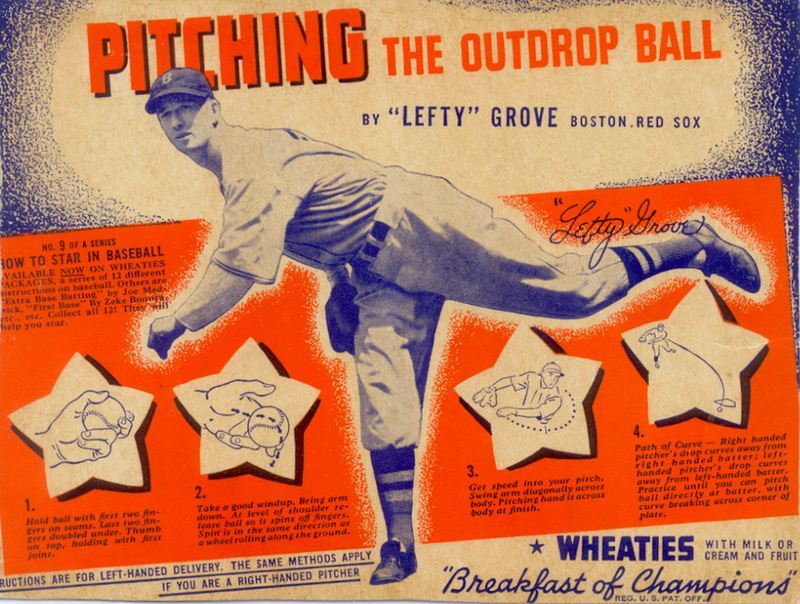 Wheaties, for example, built their "Breakfast of Champions" name by signing dozens of 1930s athletes to endorsement deals, a great achievement for what's otherwise unremarkable cereal. Is the cap for you or your boy? How about the tobacco? The evolution of marketing to children, even when they're the indirect target, helps us understand why some governments prohibit or circumscribe such advertising today. Many adults struggle to separate a directed message from its personal consequences, whether or not the product is beneficial. Those who look to us for leadership deserve help in making decisions that impact what they'll enjoy as both customers and kids. Kind of heavy at the end, but it's a subject that deserves careful thought. I hope there was something new to you in that marketing chronology. I bring deep curiosity into any subject, work included, and look forward to talking with you about how this can help [company]. Longer than I usually spend on a cover letter, that's for sure! Lot more interesting than the cover letters I read. I'd hire you! Very cool, and good idea! Thanks, I'll start with Night Owl's virtual job and move up!